We test the Naish Park a few years now. The new Park is really tuned. Better low-end and more feedback & bar pressure. We tested the Park in waves with a strapless 5'10 surfboard. But this kite is a well made all-round storm kite. Great fun, well tuned and widely useful. All round awesome kite. The sweet spot for me on a TT on a 10m is 15-22 knots. Very stable and predictable kite with good turning speed, and has something to offer for riders at all levels of experience. We’re big fans of kites that claim to do it all because for most of us – that’s exactly what we’re looking for. The park has always been exceptionally fast and that’s something that has created a really loyal following! The 2014 Park is quicker than ever but also much more stable. We tested this kite in some really tricky conditions (very gusty side off wind) and the park performed like a champ. The park does pinch on the wingtips when you turn it hard. It doesn’t affect the performance (in fact we’re sure it was designed that way) but if you’re used to your kite being one solid shape at all times it will take some getting used to. Because you don’t want to have a quiver of different kites for different conditions. The park will handle anything you can throw at it! 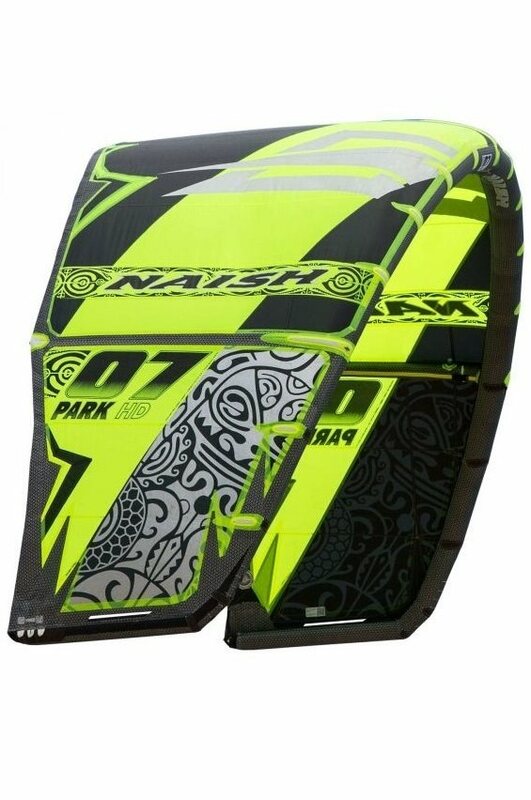 Tested the 2012 & 2013 naish park in the past. With the new Park 8m you immediately feel the difference. More bar pressure, better low-end. This low end is great for the wave riders, with a smaller kite you get more wind range. This wind range is the best new feature of the new Naish Park. Now the kite feels complete. This 8m Park is a Fast & playfull kite. This Park 8m is the key size between the small and middle size kite range. With this 8 m you really cover the range from 16 until 30 knots. What i didn't like was the drift from the park this would even please the wave riders more but its a allround freeride kite so you need some freestyle pop/lift in the kite to hand in on the drift. Nice Park this year! Naish has finally succeeded in making the Park with a really good low end I was unanble to test the range of the high end due to the conditions. Also they have taken out the pully's from the brilde making the steering much directer and quicker. The diameter of the bar has been reduced, this makes it much easyer to steef the Kite with your fingertips. Also, they have taken of the individual bumps on the grip and have replaced them with a single long edge, giving you more freedom to place your hands. I tested the kite in low wind (12 to 15 knts) on flat water and in chop. I was surprised that I could even go out, weighing 96 kg using my 132cm shinn twintip. The next day I tested it in 16 to 24 knts of wind using my twintip and Hollanda custum surfboards directional. I experianced the excellent lift and sweetspot. Later, in small waves the Kite performed excellent and was drifting along as I did my turns and rode the waves. I recommend this for allround riders from any level.